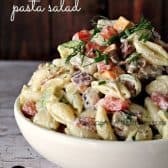 A delicious combination of pasta, chicken, bacon, cheddar, avocado and homemade ranch dressing! Combine all dressing ingredients and set aside. Cook pasta according to directions. Rinse under cold water. Toss all ingredients in a large bowl except dressing. Add dressing to taste (there may be leftover dressing).